What's new at The Painted Chest? Workshops have finally been scheduled! I know many of you have been eagerly awaiting this announcement. Last day to sign up for this class is December 5th! This will be a Christmas themed Milk Paint 101 Workshop. We will be making a Christmas themed sign at the end of class. ****IMPORTANT**** In the "Notes to Seller", please choose which word you would like to have on your sign: Joy, Believe, Noel, Love, HoHoHo, or Santa. This is a Christmas Sign Workshop for those of you who have already taken Milk Paint 101. You've been through 4 hours of instruction and you have a good grasp on how to mix and use Milk Paint. So come for a relaxing evening with your friends and make a Christmas sign to enhance your holiday decor or to use as a Christmas gift! The Milk Paint 101 furniture refinishing class is a hands-on learning experience in the world of Miss Mustard Seed's Milk Paint. You will learn how to mix milk paint, painting techniques and explore the different top coats. You will leave this class with a fun project that you can take home. 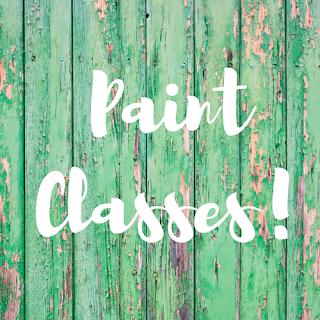 Classes will be held at The Painted Chest, 1340 Walnut Street, Murphysboro, Illinois. The cost is $65 and this includes 4 hours of instruction and all paint, supplies, and materials needed in class as well as a sign you will make to take home. There is a limit of 8 people per class. Fusion Mineral Paint kitchen cabinet makeover classes will begin after the new year. December 6th is also the Deer Hunting Widows Shopping Event for the Unique Shops of Murphysboro. The Event will take place from 10am to 3pm. Shoppers can participate in a Scavenger Hunt that will take them from store to store trying "hunt" down the items that match their clues. They will then be entered for a Grand Buck prize! Stores will have light refreshments and when you are ready to take a short break, Jack's Meat Market and Deli will have a lunch special available sure to cure your hungry appetite. We have a new Miss Mustard Seed's Milk Paint Color of the Month! Boxwood is the new color for the month of December. During the month of December you will receive 10% off of every quart of Boxwood Milk Paint. Boxwood is our rich, dark grassy green. Depending on the finish used on the piece, it can look bright and bold or subtle - more like a muted olive. Boxwood is named for the preserved boxwood wreaths and topiaries Marian uses in her interiors. Boxwood mixes well with Grain Sack to create a pale aqua. Layer under Lucketts Green for a two-toned monochromatic look. Thank you all for you support and encouragement as I begin this new adventure! I hope to you in the store soon! 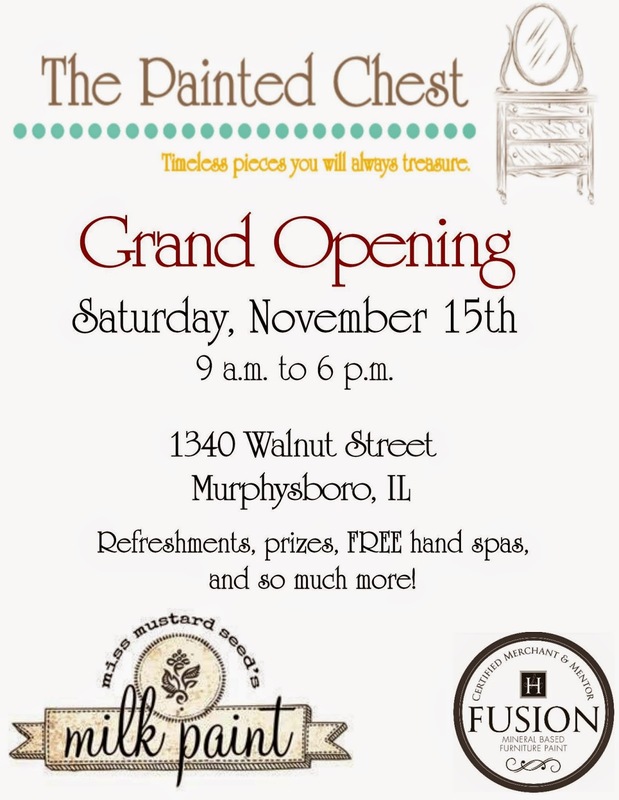 The Painted Chest was featured in our hometown newspaper, the Murphysboro American.